July 3, 2012 - On Thursday, the 40th Flight Test Squadron made history flying the first aircraft to use a new fuel blend derived from alcohol. "The A-10 is the first aircraft ever to fly on this fuel," said Jeff Braun, Chief for the Air Force Alternative Fuel Certification Division, at Wright-Patterson Air Force Base, Ohio. "It flew like a usual A-10 would without any issues," said Maj. Olivia Elliott, an A-10 pilot and an evaluator for the mission. The fuel, known as ATJ (Alcohol-to-Jet) is the third alternative fuel to be evaluated by the Air Force for fleet wide use as a replacement for standard petroleum derived JP-8 aviation fuel. Before ATJ, other alternative fuels included a synthetic paraffinic kerosene derived from coal and natural gas and a bio-mass fuel derived from plant-oils and animal fats known as Hydroprocessed Renewable Jet. ATJ is a cellulousic-based fuel. It can be derived using wood, paper, grass, anything that is a cell-based material. The sugars extracted from these materials are fermented into alcohols, which are then hydro-processed into the aviation-grade kerosenes used for aviation fuel. An A-10C Thunderbolt II takes off from Eglin Air Force Base, Fla., June 28, 2012, marking the first flight of an aircraft powered solely by a alcohol-derived jet fuel blend. ATJ, or Alcohol to Jet, is a cellulousic-based fuel. It can be derived using wood, paper, grass, anything that is a cell-based material. The sugars extracted from these materials are fermented into alcohols, which are then hydro-processed into the aviation-grade kerosenes used for aviation fuel. The Fischer-Tropsch SPK blend has been fully certified by the Air Force for operational use throughout the Air Force. All testing of the bio-mass HRJ has been completed and formal coordination is underway to certify it as an approved fuel agent. Like ATJ, the bio-mass fuel was first tested by 40th FLTS in 2010, using the same A-10 test platform. 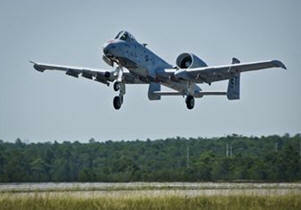 "The A-10 is an excellent platform for testing the new fuel due in part to its segregated fuel system," said Capt. Joseph Rojas, A-10 test engineer. "The system allows one engine to run off a fuel supply that is completely segregated from the other engine. This allows us to fly with one engine on the new fuel and the other on traditional fuel. If engine operation is normal, as with the ATJ blend, then we progress to flying with both engines on the new fuel." The A-10 ATJ fuel test went through similar ground and flight tests, using a mixture of the alternative fuel and the standard Air Force JP-8. Ground-based testing included monitoring engine performance and ensuring all data correlated favorably to both the technical requirements and JP-8 fuel specification. Flight tests included analyzing aircraft performance during controlled accelerations and climbs and operational maneuvering. The Air Force has recently approved fleet-wide certification efforts of the ATJ fuel blend. Once the AFCD completes all air and ground testing, the ATJ will be approved as an official alternative fuel source for Air Force use. "Eventually, it is possible that aircraft will see JP-8 consisting of all these alternatives," said Braun. "You won't be able to determine the difference and you won't care, because all perform as JP-8."